Spend your weekend at The Malayan Plaza and rest in our Studio Twin Deluxe room accompanied with buffet breakfast all for two (2). 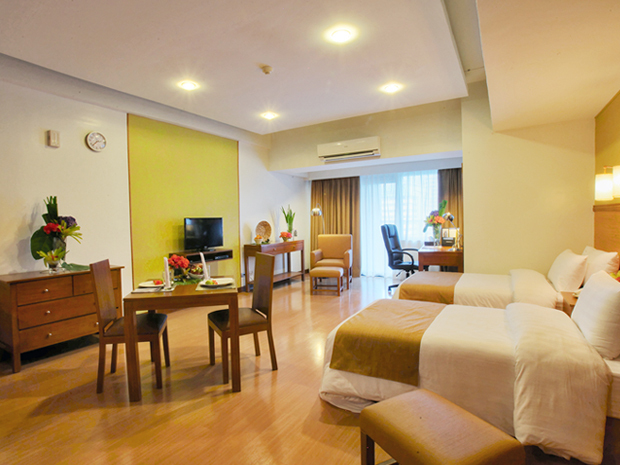 Enjoy premium comforts at our hotel in the heart of Ortigas Center. All rooms are designed to address your every need, whether here for a leisurely visit or a corporate seminar. Each accommodation is equipped with Wi-Fi access, and furnished with an LCD TV, phone, work desk, and electronic safe. Dining and kitchen amenities are provided, an essential to guests staying in the city for the long haul. Whatever you require for your stay, we offer it here at The Malayan Plaza. Besides rooms and function venues, you can let off steam at the gym. And there’s the swimming pool and restaurant to satisfy your senses. Plus, room service and daily housekeeping are offered to ensure convenience at every turn. 1. Valid for weekends only (Saturday - Monday) from Ocotber 1, 2017 to December 31, 2017. Subject for room availability. 2. This voucher is valid for a weekend stay in a Studio Twin Deluxe room with buffet breakfast for two (2). 3. Redemption must be made at http://whyqueue.shop/member/redeem. 4. Rebooking of reservation maybe made without penalty at least (3) days before reservation date. For rebooking please email ghsmarketing@myghs.com. 5. For extra person, additional charges may apply to be paid directly at the hotel. 6. eVoucher & a valid ID are required upon check-in. Change of name will not be accommodated. 7. For eVoucher use as gift or transferred, a valid copy of owner's ID must be presented together with the eVoucher. 8. All incidental charges will be on the personal account of the guest. Deposit to be given directly to the hotel. 9. Not valid in conjunction with any other discount/s or promotion/s such as Senior Citizen, PWD & Diplomat. Experience stylish living amid one of Metro Manila’s bustling business and commercial district. At The Malayan Plaza Hotel in Pasig City, you’ll find a home within the vibrant Ortigas Center where corporate offices, restaurants and bars, and shopping destinations converge. All of these, plus the best of what the city has to offer, are right at our doorstep. Our Pasig City hotel combines the warm ambiance of home with state-of-the-art services to meet—and even exceed—the expectations of business clients, transients, and globetrotters. The largest rooms among the hotels in the area. Lodgings with living, dining, and kitchen areas. In-room Wi-Fi access. Meeting venues, a restaurant, swimming pool, and gym. Here, you have everything you need to enjoy superb urban living, whether staying for a short while or for the long term.